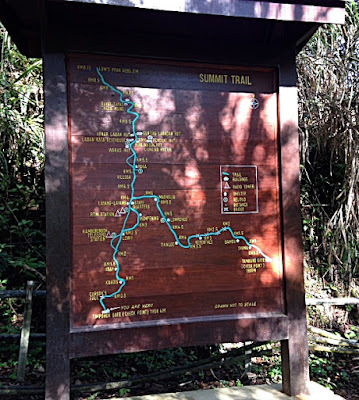 Osman took us to the entrance of the mountain trail to look for the Bornean Swiftlet, which are endemic to Borneo and believed to be only around the northern mountain area. We enjoyed the view but had no luck for the swiftlet. You have to book in advance to enter the summit trail and be with a licensed guide inside the gate. Due to the big earthquake in June 2015, some parts of the trail are still closed and one of them will reopen in December 2015. The bird we hadn't expected to see so closely was resting (or waiting for its prey?) in a tree when we were walking back on the path. Look at these sharp long talons!!! He/she was staying there long enough for us to set up our scope and we had a great view of him/her through it. I could have stayed there all day watching him/her! Only some trees away from the hawk-eagle, a Mountain Imperial Pigeon was sitting in a tree. The pigeon is rather bulky but it looked tiny compared with the hawk-eagle! a very colourful bird with the orange beak, eye-rings and legs and its unmistakeable chestnut head! When we set out on our birding again later on, I didn't manage to get much of a chance to take photos of birds.